Solar Prominences and Filaments appear as dark filamentary objects on the solar disk (filaments) and as protuberances on the edge of the solar disk (prominences). They generally sit above magnetic neutral lines, outlining the demarcation of negative and positive magnetic fields on the Sun's surface. Filaments are formed in magnetic loops that hold relatively cool, dense gas suspended above the surface of the Sun. A huge solar prominence erupted on Dec 6, 2010. This movie shows "cool" solar plasma (60,000-80,000 K, seen in He II 30.4 nm) in red and hot plasma (almost 1 million K, Fe IX 17.1 nm) in yellow, observed with the AIA instrument on SDO. Prominences are generally less violent than solar flares. They are cool sheets of gas that condense out of the corona above the active regions. Some are quiet and hang there for weeks, others rain matter down on the photosphere, still others literally explode into space, pushing the corona out in front of them in a great burst that carries the gas off the sun altogether." Dramatic prominences can sometimes be seen looming just beyond the edge of the sun. 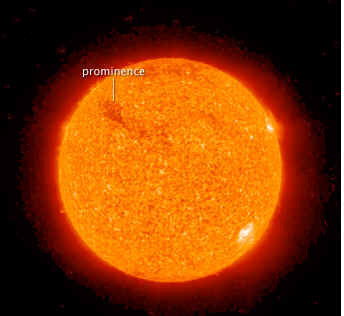 A solar prominence is a cloud of solar gas held just above the surface by the Sun's magnetic field. The Earth would easily fit below the prominence on the left. A quiescent prominence typically lasts about a month, and may erupt in a Coronal Mass Ejection (CME) expelling hot gas into the Solar System. Although very hot, prominences typically appear dark when viewed against the Sun, since they are slightly cooler than the surface. The solar corona is constantly losing particles. Protons and electrons evaporate off the sun, and reach the earth at velocities of 500 km/s. Most of the mass of the sun is held in by magnetic fields in the corona, but particles slip through occasional holes in the fields. 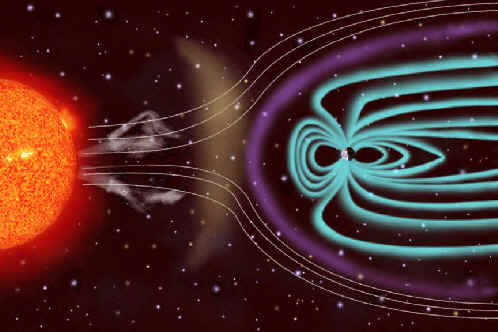 Solar wind affects the magnetic fields of all the planets in the solar system. When the solar wind hits the Earth's magnetic field, the wind compresses the field and creates a shock wave called the Bow shock. Closer to the Earth are the Van Allen radiation belts where solar particles are trapped due to magnetic forces. 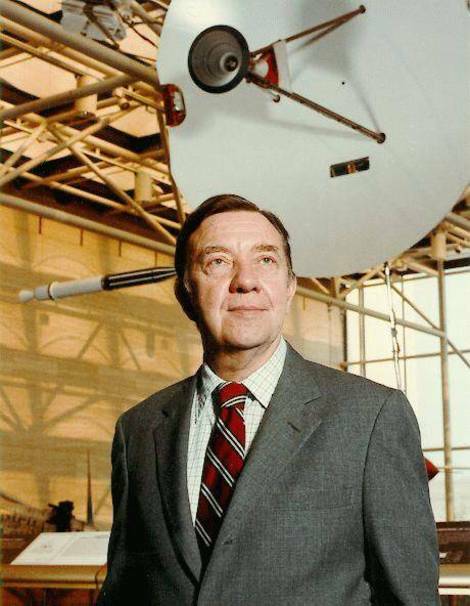 James Alfred Van Allen (September 7, 1914 – August 9, 2006) was an American space scientist at the University of Iowa. The Van Allen radiation belts were named after him, following the 1958 satellite missions (Explorer I and Explorer III) in which Van Allen had argued that a Geiger counter should be used to detect charged particles. Still closer are huge rings of electric current around the poles, formed by the influence of the solar wind on the magnetic field.Earth, Jupiter, Saturn, Uranus, and Neptune have magnetotails where the wind extends their magnetic field. The heliopause is the boundary where the sun's solar wind hits the gasses of interstellar space. The sun's particles flow at least to Neptune, and probably farther. In the corona, above sunspots and areas of complex magnetic field patterns, are solar flares. These sparks of energy sometimes reach the size of the Earth and can last for up to several hours. Their temperature has been recorded at 11 million K (20 million degrees F). The extreme heat produces x rays that create light when they hit the gasses of the corona. Schematic diagram of a solar flare. Red and blue lines represent magnetic fields, carrying solar material off the surface. Flares occur when these field lines meet and "reconnect", producing huge explosions, and heating and acceleration of solar material. Credit: NASA Marshall Space Flight Center. Solar flares are intense, temporary releases of energy. They are seen at ground-based observatories as bright areas on the Sun in optical wavelengths and as bursts of noise at radio wavelengths; they can last from minutes to hours. The primary energy source for flares appears to be the tearing and reconnection of strong magnetic fields. They radiate throughout the electromagnetic spectrum through visible light out to kilometer-long radio waves. A flare is defined as a sudden, rapid, and intense variation in brightness. A solar flare occurs when magnetic energy that has built up in the solar atmosphere is suddenly released. Radiation is emitted across virtually the entire electromagnetic spectrum, from radio waves at the long wavelength end, through optical emission to x-rays and gamma rays at the short wavelength end. The amount of energy released is the equivalent of millions of 100-megaton hydrogen bombs exploding at the same time. 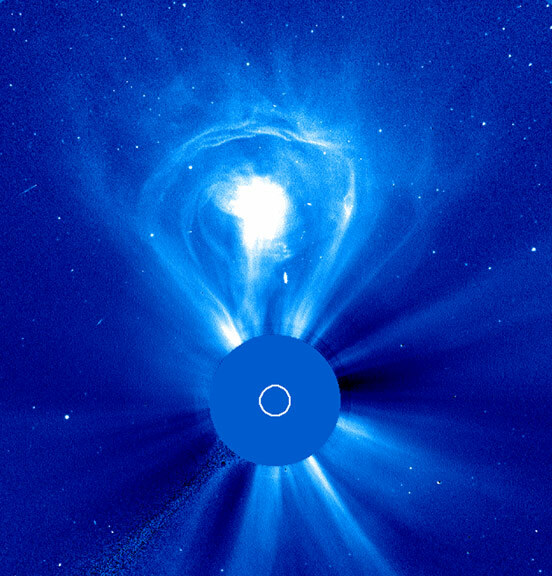 This "lightbulb" Coronal Mass Ejection (CME) shows the three classical parts of a CME: leading edge, void, and core. Taken on February 27, 2000 by the LASCO C3 coronagraph. As the magnetic energy is being released, particles, including electrons, protons, and heavy nuclei, are heated and accelerated in the solar atmosphere. The energy released during a flare is typically on the order of 1027 ergs per second. Large flares can emit up to 1032 ergs of energy. This energy is ten million times greater than the energy released from a volcanic explosion. On the other hand, it is less than one-tenth of the total energy emitted by the Sun every second. There are typically three stages to a solar flare. First is the precursor stage, where the release of magnetic energy is triggered. Soft x-ray emission is detected in this stage. In the second or impulsive stage, protons and electrons are accelerated to energies exceeding 1 MeV. During the impulsive stage, radio waves, hard x-rays, and gamma rays are emitted. The gradual build up and decay of soft x-rays can be detected in the third, decay stage. The duration of these stages can be as short as a few seconds or as long as an hour. 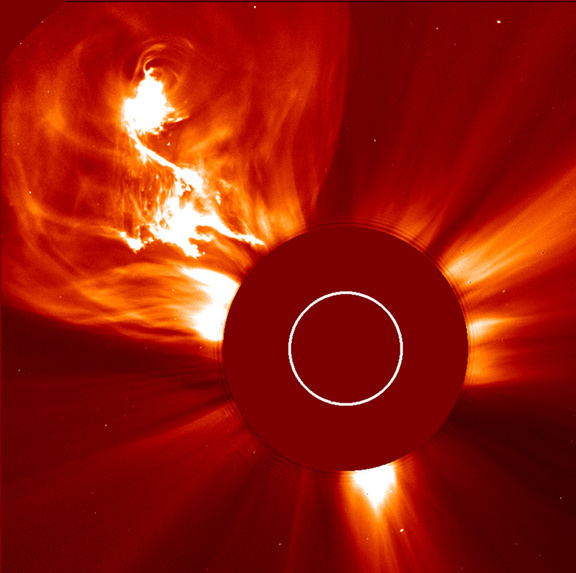 Solar flares extend out to the layer of the Sun called the corona. The corona is the outermost atmosphere of the Sun, consisting of highly rarefied gas. This gas normally has a temperature of a few million degrees Kelvin. Inside a flare, the temperature typically reaches 10 or 20 million degrees Kelvin, and can be as high as 100 million degrees Kelvin. The corona is visible in soft x-rays, as in the above image. 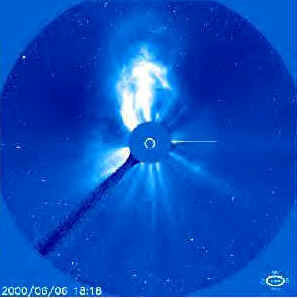 Notice that the corona is not uniformly bright, but is concentrated around the solar equator in loop-shaped features. These bright loops are located within and connect areas of strong magnetic field called active regions. Sunspots are located within these active regions. Solar flares occur in active regions. The frequency of flares coincides with the Sun's eleven year cycle. When the solar cycle is at a minimum, active regions are small and rare and few solar flares are detected. These increase in number as the Sun approaches the maximum part of its cycle. Each category for x-ray flares has nine subdivisions ranging from, e.g., C1 to C9, M1 to M9, and X1 to X9. In this figure, the three indicated flares registered (from left to right) X2, M5, and X6. 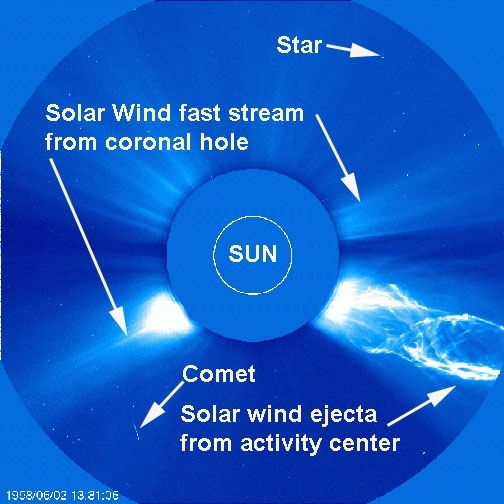 The outer solar atmosphere, the corona, is structured by strong magnetic fields. Where these fields are closed, often above sunspot groups, the confined solar atmosphere can suddenly and violently release bubbles or tongues of gas and magnetic fields called coronal mass ejections. A large CME can contain 10.0E16 grams (a billion tons) of matter that can be accelerated to several million miles per hour in a spectacular explosion. Solar material streaks out through the interplanetary medium, impacting any planets or spacecraft in its path. 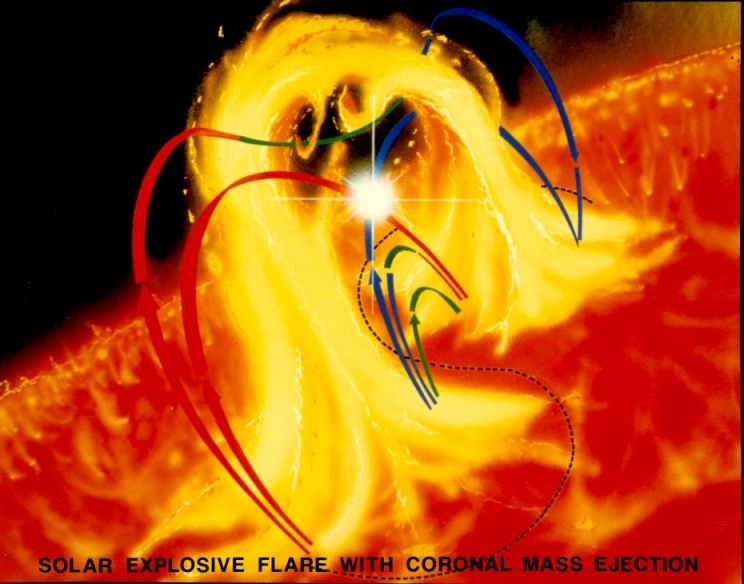 CMEs are often associated with major solar flares. Usually, the CMEs which cause the Earth the most trouble are indeed those associated with solar flares. The others occur with filament eruptions. People in the Northern Hemisphere have particular reason to keep an eye on the sun, both because of geography and geology. The region is relatively close to the magnetic North Pole, where solar disturbances often enter the Earth's atmosphere, and the granite bedrock below readily conducts surges of electricity. Though NASA scientists say the solar maximum this cycle may be more potent as the last one, society is more vulnerable to damage today because so much more technology orbits the Earth. Hundreds of satellites, most of them used for telecommunications, have been launched since 1989. In a worst-case scenario, they say solar storms could knock out all high-frequency radio on the sunlit side of the Earth or expose airplane passengers in northern latitudes (near the North Pole) to the equivalent of 100 chest X-rays.